While bolt-action rifles may be the stereotypical idea of a hunting rifle for many people, hunters in the Northeast and Upper Midwest have often favored other types of rifles when hunting in heavy woods and thick brush. That’s where the pump-action rifle comes into its own. And perhaps no other pump-action rifle is as famous or as widespread in use as the Remington 760 and 7600. In heavy woods shooting distances will often be under 100 yards, with a high likelihood of trees, branches, and brush getting in between you and your prey and deflecting your bullet. Thus the likelihood of needing a quick second shot is greatly increased. While bolt-action rifles are accurate, they aren’t the quickest for follow-up shots, so pump-action rifles such as the Remington 760 and lever-action rifles such as the Winchester 94 are often favored for their ability to allow quick follow-up shots. 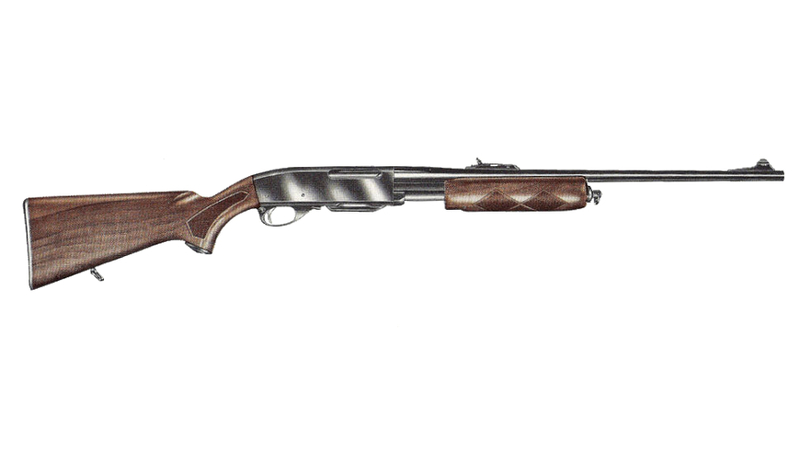 The Remington 760 was introduced in 1952 and featured a receiver shaped similarly to the Remington 870 shotgun as well as a manual of arms almost identical to the 870. If you were a hunter used to using the Remington 870 for birds, or using slugs in the 870 to hunt deer, then the transition to the 760 would have been easy. The trigger, pumping action, and safety of the gun all would have been familiar to you. The only difference was that the 760 featured a detachable box magazine, allowing for easier loading than a shotgun and for the use of spitzer bullets that couldn’t be used in a lever-action rifle. That made the Remington 760 one of the most popular hunting rifles in the country, with over one million produced before production ceased in 1981. The 760 was available in numerous popular hunting cartridges, including .30-06 Springfield, .270 Winchester, .308 Winchester, .243 Winchester, .35 Remington, and .257 Roberts. Remington replaced the 760 with the 7600 in the 1980s. The 7600 features a more conventional bolt design and was designed to be easier and cheaper to manufacture. It too is available in numerous popular hunting calibers, including .30-06 Springfield, .243 Winchester, .308 Winchester, and .280 Remington. There is even a special version of the 7600 produced known as the 7615P, chambered in .223 Remington and fed from standard AR-15 type magazines. To someone who doesn’t know anything about guns, these rifles don’t look too different from a pump shotgun. The thinner barrel, smaller ejection port, and rifle sights identify it as a rifle to those who are familiar with firearms, but with the blued steel and wood furniture it won’t attract notice from those who fear guns and want to ban them. The standard chamberings available in the Remington 760 and 7600 are capable of taking just about any game in North America. That’s particularly true for the .30-06 version, which is by far the most popular. The .30-06’s versatility allows it to be used with light bullets on varmints, heavy bullets on big bear, and other bullet weights for everything in between. With so many of these rifles having been produced, aftermarket caliber conversions abound, allowing a shooter to chamber his rifle in other calibers such as 6.5 Creedmoor, 7mm Mauser, 8mm Mauser, .338-06, and 9.3x62mm. All sorts of other options exist to allow shooters to customize their rifles, from stocks to sights to scopes, allowing for them to make the rifle fit them perfectly. The fact that the 760 and 7600 take detachable magazines means that a market has sprung up for aftermarket magazines. These include magazines that hold up to 10 rounds, making the rifles at least semi-viable for self-defense. However, these aftermarket magazines are notorious for feeding difficulty, meaning that you really need to test every magazine you buy to make sure that it is 100% reliable. Neither the 760 nor the 7600 are intended for high-volume shooting. Both are prone to developing excessive headspace with relatively mild amounts of shooting, and because of their design therefore will need new barrels. The interrupted thread bolt lockup of the 760 is also prone to wear, as are the action rails and grooves of both the 760 and the 7600. Expect to get about 1,000 rounds of useful life out of one of these guns before serious repairs or replacement are needed.